HEALTH PROFESSIONAL SEMINARS Dublin & Galway – please circulate to staff and students that maybe interested in attending. 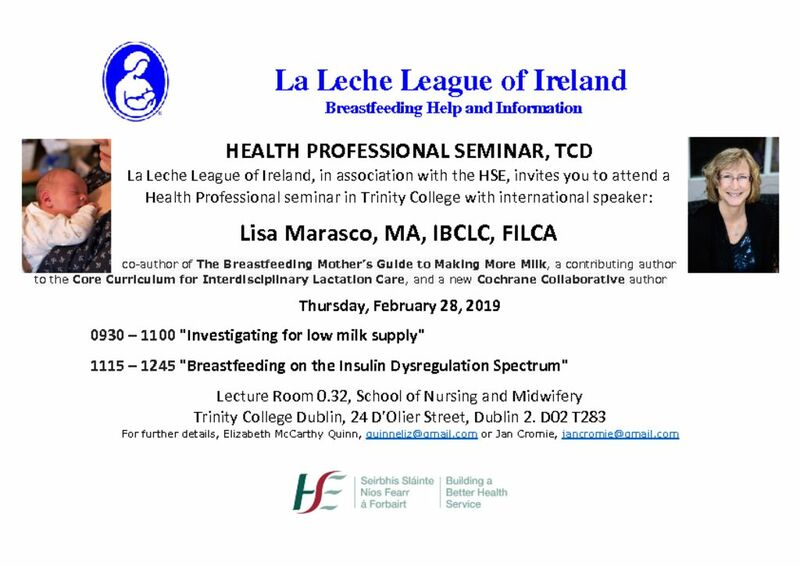 La Leche League of Ireland, in association with the HSE, invites you to attend a Health Professional seminar in with international speaker: Lisa Marasco, MA, IBCLC, FILCA co-author of The Breastfeeding Mother’s Guide to Making More Milk, a contributing author to the Core Curriculum for Interdisciplinary Lactation Care, and Cochrane Collaborative author. This seminar will be held on Thursday February 28th in Dublin and repeated in Galway on Friday 1st March.